Get ready, and you will be ready for any communication! 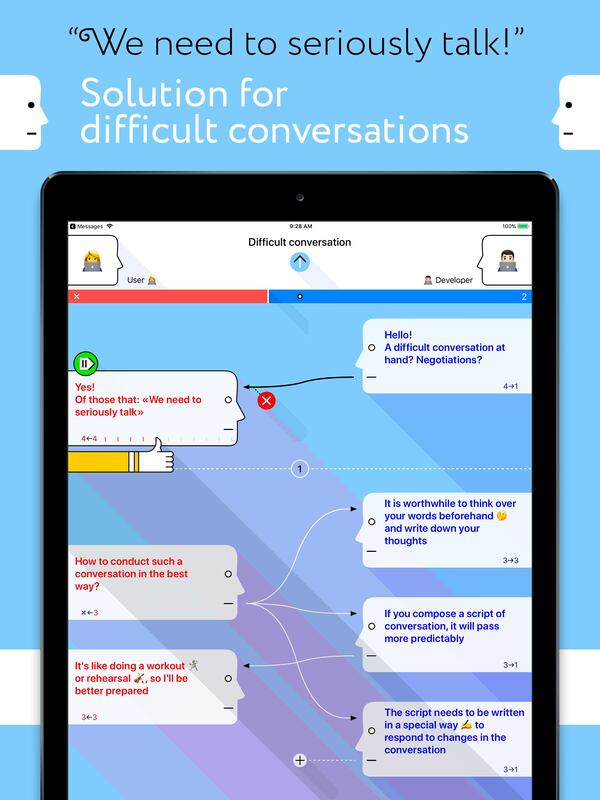 Build a conversation script, think through the questions and your answers 🤔 — all this in a simple visual form is always at hand✊. With full synchronization across all mobile devices via iCloud 📱📲📲. Do not invent answers in a hurry 🏃‍♀️, think them out in a calm environment with a cold head 🛋☕️☕️🍫🎼, let your opponents hurry and get lost with the thought 😬. If you are anxious before meeting 😱, and sometimes it happens to everyone, then a scenario plan will be useful help and will give confidence. This is another way to do it the best way ✅. If by virtue of your features you experience difficulties in communicating with people, write to us — if possible we will share with you a free promotional code for the application. Open Message 💬 — there inDispute will also be waiting for you, always ready to help you in search of a lightning-fast stunning response to the next message. No typos and unfortunate auto-replacements — everything is checked in advance. Uncomfortable situations are not about you 😎. Print the outline of the conversation, use it as a map 🗺 to come to the desired outcome of the negotiations. You will have a navigator in your hands, while others do not have even a compass. Even if you are a hermit and a pure introvert 🙈🙉🙊, inDispute will help you make decisions and allow you to conduct hypothetical virtual conversations. All the best things happen to us in the process of communication 🌜✨🌛, you just need to be ready for it!